It is a kind of alchemy. 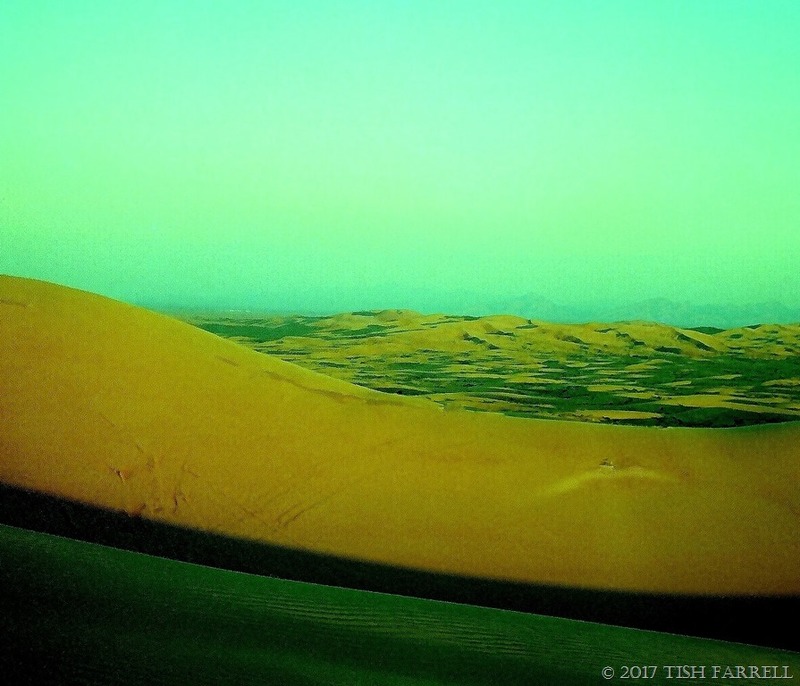 As the sun sets, and its glow flows out across the desert, the dunes that in the full light of day had been dun coloured, inert, dull even, transform into waves of molten copper. To drive into the desert in late afternoon was blissful. The emptiness. And more emptiness. AND NO PEOPLE. We had come to Dubai for a break from Nairobi living. Sometimes life there could become too nerve-fraying. During the Moi era, security was always an issue in Kenya. Whenever the political temperature heated up – which was often during the 1990s’ donor push for multi-party democracy – so the crime wave spiked. It was mostly white collar crime too – run by crooked lawyers, senior officials and cops – all people who should know better. Car-jacking was a speciality, and the diplomatic and aid community were particular targets with their newly imported 4 x 4s that were shipped in with each fresh posting. So it was that High Commission cocktail party talk mostly involved expats’ tales of having their vehicles stolen in hair-raising scenarios, usually by men with AK47s who had followed them into their driveways as they were returning home. Then there were the stories from Graham’s Kenyan colleagues. If they were driving project vehicles they would be car-jacked AND taken hostage for hours on end. We never did understand why car-jackers did this – driving around the city for hours until they finally decided to dump the unfortunate hostage in some god-forsaken wasteland. Then there were aggravations such as coming home from a four-day seminar to find the house without electricity and the freezer dripping into the hall. In our absence some officious meter reader had been let into the property to read the meter. He misidentified our house number and claimed we had not paid our electricity bill. He then went off with our house fuses, and it took a week of hideous argy bargy with closed-minded officialdom to have the power restored. They claimed they had never heard of a meter man taking the fuses with him. Usually, they said, he would simply hide them somewhere handy, to be reinstated once the bill had been paid. In the meantime, nothing in our house worked since everything was electric. And all the security devices which the High Commission insisted we had, pretty much useless. We have paid our bill, we kept saying to the electricity men. We have the receipt. These were the wrong words. Kitu kidogo were the right words. A little something. But as we didn’t play, we had to wait. Eventually a couple of very pleasant engineers took pity on us, and called in to see what was going on. After remonstrating at the lack of fuses as if this was our fault, they decided to make some new ones, standing on the kitchen stoop by the fuse box, winding wire round spools while admiring my crop of Tuscan kale, a variety they had never seen before but were much taken with. It was nice to have the lights back on. Playing scrabble by candle-light might seem vaguely romantic, but it wasn’t really, not after the first night. And on top of the power-out dilemma, the weather had been vile – an El Nino special of weeks of endless torrential rain – people drowned, homes and whole villages washed away, impassable roads, the place unnaturally cold and grey and impossibly WET. It made us realise that we had very little to complain of. At least we had a roof over our head, and it only leaked a bit in the sitting-room corner. But then the long wet spell next promoted an outbreak of ‘Nairobi Fly’ or Nairobi Eye – a rove beetle that causes extremely painful skin conditions if you happen to brush it away with too much enthusiasm, and then use the same hand when touching some area of bare flesh. For a time the whole city seemed under siege from this nasty little bug, the press burbling with horror stories of men whose private parts had become horribly inflamed due to some inadvertent contact. (Er, hem). So it was good to fly away. It was good to spend a night in the desert even if our Tanzanian guide did lie in the back of the 4 x 4 with the door open and snore all night. It was good to get up at dawn to a bright, crisp day and walk alone through the dunes, and to see for miles and miles, without a soul in sight, only the distant blue spine of Oman’s El Hajar Mountains. It made the spirits soar, all that aloneness, as if you could face anything, though a month there might have truly done the trick. P.S. In case you are wondering, the green areas in the last photo are plots of alfalfa – high octane fodder for Dubai’s racing camels which are also reared in the desert on small camel farms. 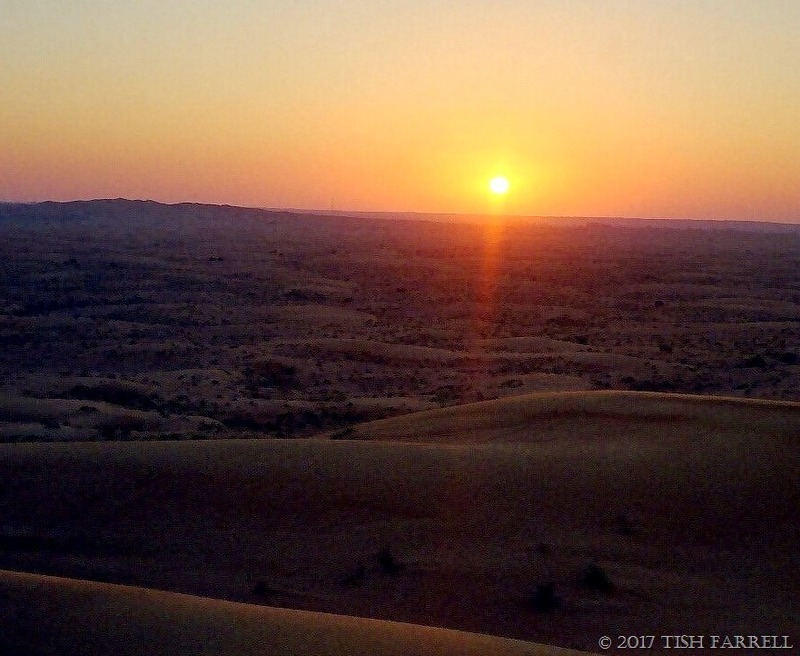 Posted on March 17, 2017 March 17, 2017 by Tish Farrell	This entry was posted in photography, Travel and tagged atop, Daily Post Weekly Photo Challenge, Dubai, landscape, Tish Farrell Writer. Bookmark the permalink. ← “Life, Jim, but not as we know it”? You do a wonderful job of reminding me how safe and orderly my life is; and how much I like it this way. I do love your first shot particularly; it reminds me of the opening scene of ‘The English Patient’. Oh yes. What a film. That makes me wonder if I’d have felt quite so exhilarated if we had driven for days into the desert and far, far away from city living. Our one-night-stand – was very much desert-light. Not only that, our guide came armed with huge picnics provided by the Dubai Hilton. Oh the idea of a picnic (catering from the Hilton!!!) in the desert. I would have to insist on someone reading from Herodotus though. Definitely! And a skyful o f stars above. A great deromanticising of foreign parts – and then the romance of the emptiness and silence of the desert! Dubai must have been different then. I dare say the city has caught up with the desert by now. They were building like crazy when we were there. Never seen so many high-rises popping up, and then lots of ribbon development of dinky palace homesteads along the main highways. A very strange place actually. Even the Bedouin had been relocated to some pretty upscale houses on the desert periphery, though our guide said they rented them out and preferred their nomadic existence. I met a Bedouin in bank in Petra whose parents had been relocated when Petra became a tourist destination – they infinitely preferred their caves and traditional life. Africa is certainly intense and I imagine Dubai is as well. I’ve no desire to go to the city but the desert is quote appealing. 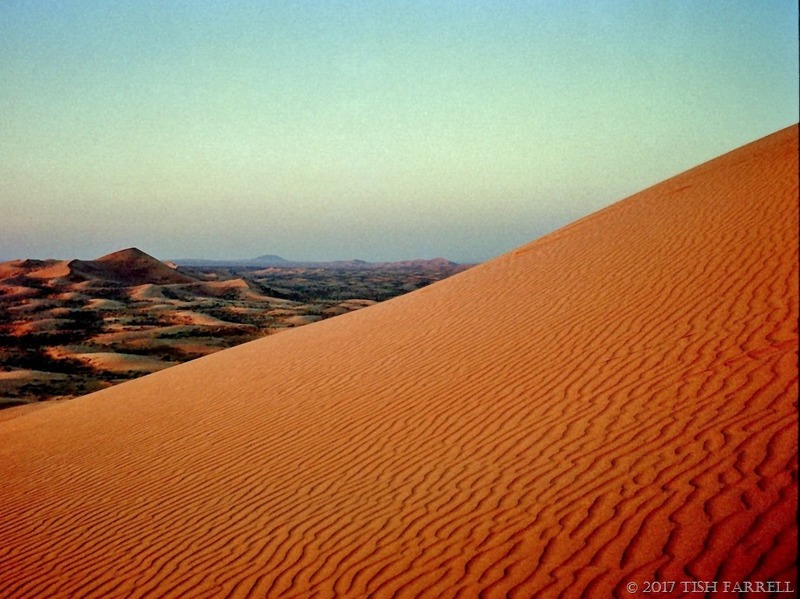 A desert is like the sea; vast open space, gentle curves, mysterious, invigorating and perpetual. Love the magic in your narrative and photography, Tish. You are transporting us into a fairy land. All that doom and gloom, not to mention corruption, crowned by an image of racing camels! 🙂 🙂 I’d love to see the desert like that, Tish. Nother one for the list, though perhaps not Dubai. Busy weekend? Must be ‘hotting up’ at the allotment? Allotment stuff is definitely hotting up. I now have a re-modelled inside of polytunnel, with beds all ready to go, and a little plastic grow house inside it too, to get the seedlings going. Yippee!Have a great weekend, Jo. Not so much as before, but still a problem. Your experience with power guys sounds so familiar. Things are changing a bit. They have prepaid meters. Well, we still have blackouts but not so frequently. Car jacking seems to have reduced. If I recall correctly, they drove around town to withdraw as much as they could from the unlucky victims. Good to hear there’s less car jacking. It was hair-raising for a time, though fortunately no one wanted our tatty little Suzuki jeep that shed its parts hither and thither, which was thus hair-raising (to me at least) for quite other reasons. Pre-paid meters sound a v. good idea. Here is a smile for you. When life got too much for us in Lusaka (car jackings etc) we took R&R in Kenya! (Mostly Nairobi). Ha! How funny. One man’s pain in the neck, another man’s resort. I seem to recall Lusaka had its hairy moments as well in the early 90s – son of Kaunda up to no good. We drove into Zimbabwe for a break, and there found life was positively tranquil, though the white folks in Harare tried to scare us a bit. So much of this is a matter of perception, and very particular circumstances. And luck! We also took R&R in Harare. Luxury and lots of food to buy! I found a note in my files which records my daughter having her first haircut in Harare. We were amazed by the shops in Harare – all the choice of food. Our local Lusaka supermarket specialised in strawberry yogurt and jars of pickled beetroot. But mostly lots and lots of cleaning materials. I can still smell them! Wax polish for the cement floor, maybe? That was strong stuff. Hmmm……I think I may have missed that one. Not sure how! Its trade name was Jik in Kenya. That name does ring a faint bell. The only desert I have been in is the Namib. I liked the stillness and the vast expense, and the dunes, but oh, the heat! I craved for ice cold drinks, but had to do with lukewarm ones as our ice rapidly melted (truck overland trip). Nothing worse than a warm cold drink. I envy you the Namib. I only got as far as Windhoek, accompanying G on a business trip. He was hoping to head a project there in 2003, but it didn’t come off. Harare was not always a picnic… my sister was matron of the hospital there and spent most of her time treating beaten up white farmers and broken African aids victims… often women…until she left after all her friends had gone…. Indeed. I know things changed for the worse in Zimbabwe. We were lucky with our timing. Harare and everywhere else we travelled in the country seemed very relaxed to us after Lusaka, which in all sorts of turmoil at the time. Now, I gather, fortunes are reversed somewhat. 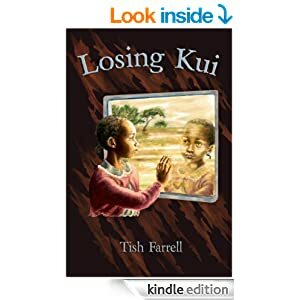 Another wonderful story Tish, though I guess living through it was not so much. It reminded of my overland trip through Africa 36 years ago. After weeks of travelling through the central African jungle I was in heaven when we finally got to the Sahara. I loved the desert. It was so clean! And dry! The opening shot is fabulous – gorgeous colour. I can well imagine the pleasure of clean, dry sand after humid, drippy forest. That sounds like quite a trip, Alison. In an instant you took me back there. Everything familiar. We used to get our breaks from Uganda and Zambia in Mombasa or in Djibouti…and in Zimbabwe when the times there were good, in the late 1980s. Would have loved to visit the desert, but that happened much later in Morocco and Tunisia. The Karoo and the Sahara sound like ‘the’ deserts to me. Graham spent time in the latter on an overland trip. I envy him that bit of the journey. I must go and look out his photos. That first photo reminds me of Namibia. The desert’s absolute silence is so healing. It does stay lodged under the skin, and stuck in the mind, this living in Africa business – panga gangs and all. Yes, panga-gangs and all. 🙂 We were the lucky ones who saw Africa’s Beauty. Kwaheri sassa Memsahib.